The best and most effective way to immediately reduce the cost of healthcare, have a more effective medical system because of less chronic disease, a healthier population where wellness will increase productivity, and a better economy is to promote the supplementation of vitamin D3 and sun exposure without sunburn. All citizens could be given free vitamin D3. This program would be by choice of the individual so as to not force government on the people. This would be very effective for all countries of the world except for the US. For countries with single payer medical insurance or government medical insurance for the entire population, this would be particularly beneficial for cost reduction in healthcare. Also, it would solve a lot of problems with doctor shortage because physicians would be freed up from treating as much chronic disease. Mary Meeker, in her report to promote general discourse on economic conditions in the US, USA, Inc. (image below is plate 315 from the slides– for full report visit KPCB where Mary works: http://www.kpcb.com/insights/usa-inc-full-report ), had very interesting suggestions in how to bring a dying US economy back to life. This report suggests treating the US as a company and handle revitalization in a similar manner as a corporate rescue. She suggested that the largest drain on the economy of the US is entitlements, in particular Medicare and Medicaid. 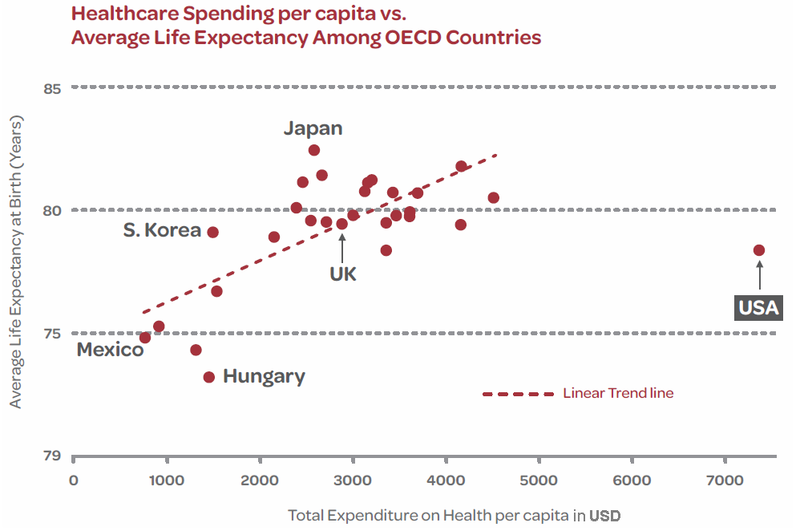 The thing that is blatantly obvious about this graph is that we are not getting the benefit from our healthcare dollar as the rest of the world. Why is this? There is approximately $4000 per capita that goes as the cost of medical insurance (!?) every year and not medical treatment. We truly have given up freedom for security. The medical industry has become this bloated by extremely poor government policy that allows insurance companies to profit without providing wealth creation to the population. If the US was being treated as a company, the CEO and board of directors would be replaced by the stock holders (or citizens should vote to replace all of our present leaders – congressmen and president). I believe the Affordable Health Care Act was designed intentionally to fail in an effort to force all medical insurance under government control, but not necessarily to correct this blotted system. It certainly has driven the cost of healthcare higher. Just imagine what we could do with national debt if we used 1.2 trillion dollars ($4000 x 300 million people) each year as an investment in things that would create wealth (insurance does not create wealth – just imagine if you were paying a third party to pay for your oil changes – why you do this with preventative healthcare?). This entry was posted in Healthcare, National Emergency, Vitamin D Battle by Mark Pegram. Bookmark the permalink.